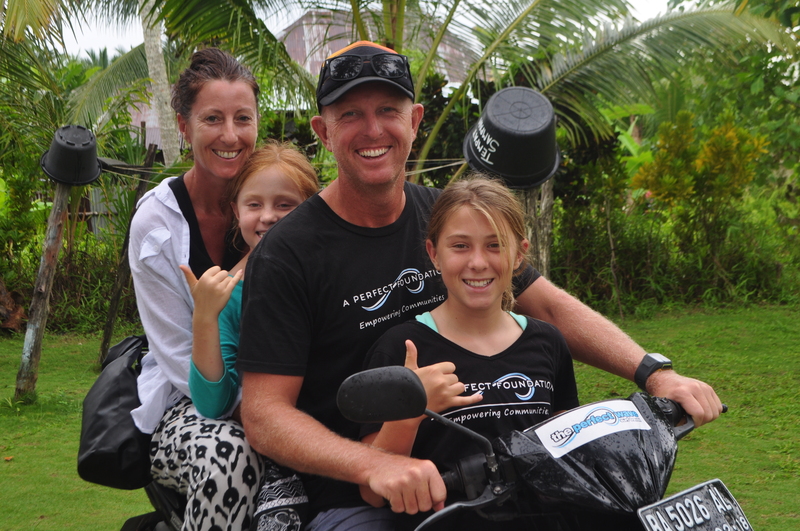 "My first trip to the Mentawai Islands was early 2015 when we collaborated with Waves For Water and assisted with the implementation of water filters and tanks in a remote village only accessible via boat. These life-saving filters meant the women didn’t have to trek 30min each way to get water and carry the heavy buckets back, then boil the water and let cool before they could drink it. Visiting places like this and seeing how these remote communities live with basic facilities and no clean water or waste management systems really makes you think about life and puts your priorities into perspective. At the time I was working for my husband’s surf travel company as a travel specialist, but I found this wasn’t giving me the fulfillment I got from helping less fortunate people. Having such an interest in this region and getting to know so many local Mentawai, we wanted to invest our time and effort into assisting what they really wanted and that was learning English skills to be a part of the growing tourism industry and learn more about creating a sustainable environment. We have been operating in this region ever since running English and Environmental programs and now have a fully functioning recycling program introduced. It’s heartbreaking when you see communities surrounded by plastic and waste and don’t know what to do with it, but it’s heart-warming when you see them excited about collecting the plastic and sorting it for recycling knowing they’re making a difference to their environment and overall health."